Rita has over 30 years experience, having qualified as a Licentiate Chiropodist at the Islington School of Chiropody in north London. Now one of our four partners, before joining Beauchamp Foot Care in 1995, she spent 11 years working as a chiropodist at Harrods. Rita is passionate about her work and dedicated to ensuring that her patients walk pain free from the clinic. Erika is one of the founding partners in this clinic and has been qualified for over 25 years as a chiropodist. She trained at the London School of Chiropody and later added to her knowledge by studying homeopathic medicine. Her dual qualifications as a chiropodist and homeopath enable Erika to offer a holistic approach that also encompasses modern clinical technology and expertise. Fiona qualified in 1990 at the London School of Chiropody and has been with our clinic 21 years, becoming a partner in 2007. She holds a Bachelor of Science degree in podiatric medicine and is a qualified lecturer in podiatrics. In addition, she is our specialist in cryosurgery and ingrown toenail surgery. Fiona works closely with Lunula Cold Laser, after having had extensive training and has treated 1000's of patients. Vicky graduated from the London School of Chiropody and has been a member of the Institute of Chiropodists and Podiatrists throughout her career. 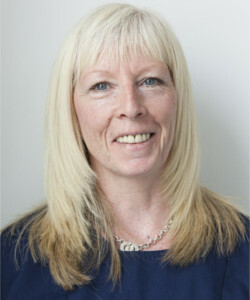 Vicky founded Beauchamp Foot Care with Erika Gibbins in 1990 and ensures her patients receive the best possible care using the latest techniques. She also received in-depth laser treatment training in the United States before bringing the technology to the UK.